Treat your complexion to the MÁDARA SOS Hydra Moisture+Radiance Mask; a lightweight formula that works to improve skin tone and texture without over-drying or uncomfortable tightness. Fortified with Northern Peony Extract, Hyaluronic Acid and Linseed, the face mask moisturises and hydrates parched skin, whilst providing antioxidant protection to defend against environmental stresses. 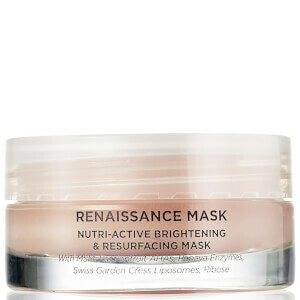 An ideal treatment for tight, itching skin or tired, stressed complexions in need of a boost. Expect smooth, healthy-looking skin with restored radiance and a soft, powdery scent. Suitable for all all skin types. Use twice a week or whenever skin feels thirsty, dehydrated and stressed. Apply to previously cleansed skin. Leave on or wipe off after 15-20 minutes. Aqua, Simmondsia Chinensis (Jojoba) Seed Oil, Alcohol, Rosa Damascena (Rosa) Flower Water, Cetearyl Alcohol, Caprylic/Capric Triglyceride, Dicaprylyl Carbonate, Arachidyl Alcohol, Behenyl Alcohol, Butyrospermum Parkii (Shea Butter) Fruit Butter, Hippophae Rhamnoides (Sea-Buckthorn) Fruit Extract, Sodium PCA, Glycerin, Stearic Acid, Palmitic Acid, Aroma, Arachidyl Glucoside, Betaine, Linum Usitatissimum (Flax/Linseed) Seed Extract, Urtica Dioica (Nettle) Leaf Extract, Paeonia Lactiflora (Peonia) Root Extract,Coco Glucoside, Xanthan Gum, Sodium Hyaluronate, Hydrolyzed Hyaluronic Acid, Hydrolysed Glycosaminoglycans, Ascorbyl Palmitate (Vitamin C), Tocopherol, Xylitol, Iron Oxide CI77492, Citronellol, Geraniol, Benzyl Salicylate, Eugenol.